Apparently, British writer George Mann has no respect for his literary forefathers. In his book Wychwood, a “Golden Age” problem is confronted with a supernatural reality. On the one hand, the book focuses on a series of brutal murders that take place in small town in Oxfordshire. On the other hand, Wychwood is a thriller imbued with paganism and the suggestion that magic can be deadly. Elspeth Reeves is more or less an outcast from the bustling city of London. A former journalist, Reeves retreats back to her hometown of Wilsby-under-Wychwood in rural Oxfordshire in order to recoup following a bad breakup. On her first day there, the body of a murdered woman turns up out in the woods not far from her mother’s house. Rather than shade her eyes and carry on with her desire toward finding the quiet life, Elspeth attaches herself to the case and fires up her computer. Before long she’s a working freelance writer for the local rag. On the official side of things, Elspeth’s long-time friend, Detective Superintendent Peter Shaw, takes over the case. He quickly decides on working with, not against, Elspeth as the bodies start piling up. It is DS Shaw and Elspeth who first cotton on to the fact that the very ritualistic killings that all seem to occur in or near the legend-haunted Wychwood may have something to do with the local legend of the Carrion King. Once a Saxon boy banished into the woods by a corrupt ealdorman, the Carrion King became a ninth century wizard-king who gathered his “apostles” in the Wychwood in order to perform pagan rituals. Now someone is recreating the Carrion King’s murders just in time for the local theater to put on a play based on the legend. 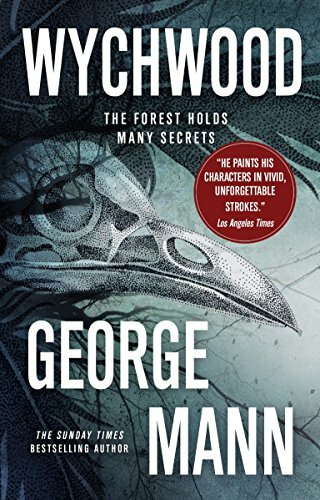 Wychwood is a highly addictive mystery that combines all the best of the “cozy” style of detective writing with the juiciest bits of horror fiction. Mann, a noted author of science fiction, weaves the genres together quite well, although the novel’s supernatural element is somewhat chaotic and ill defined. Put simply, Wychwood could work as a straight mystery, but could not work as a pure dark fantasy tale. Elspeth and Peter are well-drawn characters, even if the romantic energy between the two is obvious from the first meeting. Similarly, in drawing up the various eccentrics who inhabit Wychwood, Mann successfully makes his rural English landscape captivating without becoming ridiculous. This is no mean feat, especially considering that one of Mann’s characters is a local theater actor with an obsession with Anglo-Saxon black magic and cigarettes. Despite some missteps (including a rock concert in London that is never mentioned again) and at least one abrupt scene involving a haunted mirror, Mann’s novel is great fun and a spectacular read. The story of the Carrion King story is so good that you’ll want it to be real. Furthermore, thanks to Mann’s excellent portrayal of rainy, yet culturally warm Oxfordshire, readers may forever fall in love with the English countryside.